Illuminating 10 key aspects from the New Testament, renowned Bible teacher Philip Greenslade offers engaging insights into the Bible that are worth knowing. 10 Things Worth Knowing About The New Testament answers the "how?" and "why?" questions people may have about the Bible to help them appreciate how and why it is God's Word for them today. A great companion to Greenslade's book 10 Things Worth Knowing About The Old Testament. This book introduces the New Testament in two senses: it not only provides basic literary and historical information on each of the twenty-seven writings but also orients readers to the religious, theological, and ethical issues related to the message and meaning of Jesus Christ. The overall goal is to help interested readers of the New Testament become informed, responsible interpreters of these writings and thereby enrich their personal faith and understanding. By giving special emphasis to how the New Testament has helped shape the church's identity and theological outlook throughout the centuries, as well as the role it has played within the broader cultures of both East and West, this introduction also seeks to assist readers in exercising creative, informed leadership within their own communities of faith and in bringing a deeper understanding of early Christianity to their conversations with the wider public. Along with separate chapters devoted to each New Testament writing, there are chapters explaining how this collection of texts emerged as uniquely authoritative witnesses to the church's faith; why they were recognized as canonical whereas other early Christian writings were not; how the four canonical Gospels are related to one another, including a discussion of the Synoptic Problem; how the Jesus tradition--his teachings, stories from his ministry, and the accounts of his suffering, death and resurrection--originated and developed into Gospels written in narrative form; and how the Gospels relate to Jesus Christ as he was and is. Also included is a chapter on the writings of Paul and how they emerged as a collection of authoritative texts for the church. This chapter includes a discussion of ancient letter-writing, special considerations for interpreting the Pauline writings, and Paul's decisive influence within the history of the church and western culture. A distinctive feature of this introduction is its simultaneous publication in two versions. There is a standard, printed version with comprehensive yet detailed coverage of each writing and supplementary chapters on related introductory questions. There is also an expanded CD-ROM version, which gives fuller treatment (and supporting endnotes) to numerous issues introduced in the printed version; provides extensive, annotated bibliographies on each chapter; and includes additional maps, diagrams, charts, and other resources for classroom use and personal study. Students of the New Testament may not know everything they need to know, but they do know there's a lot they need to know! Whether studying for exams or delving into New Testament Scripture, students need critical information at their fingertips. Instead, it's usually scattered throughout textbooks, self-made crib sheets, and sticky-notes on their computer monitor. Now there's a better way! The Zondervan Get an A! Study Guides to Survey of the New Testament is a handy, at-a-glance study aid ideal for last minute review, a quick overview of the textbook, or as an aid in New Testament study. This set contains six information-packed sheets that are laminated and three-hole-punched, making them both durable and portable. The study guide is tied to Survey of the New Testament by Robert Gundry. Students of the New Testament may not know everything they need to know, but they do know there’s a lot they need to know! Whether studying for exams or delving into New Testament Scripture, students need critical information at their fingertips. Instead, it’s usually scattered throughout textbooks, self-made crib sheets, and sticky-notes on their computer monitor. Now there’s a better way! The Zondervan Get an A! Study Guides to Survey of the New Testament is a handy, at-a-glance study aid ideal for last minute review, a quick overview of the textbook, or as an aid in New Testament study. This set contains six information-packed sheets that are laminated and three-hole-punched, making them both durable and portable. The study guide is tied to Survey of the New Testament by Robert Gundry. When Pontius Pilate ordered the crucifixion of Jesus Christ, he thought he was putting an end to the Jewish uprising that had been threatening the authority of the Roman Empire. What Pilate didn't realize, however, was that real revolution was just getting started. Based on the epic NBC television series, A.D. 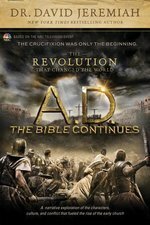 The Bible Continues: The Revolution that Changed the World is a sweeping Biblical narrative that brings the political intrigue, religious persecution, and emotional turmoil of the Book of Acts to life in stunning, vibrant detail. Beginning with the crucifixion, NYT best-selling author and Bible teacher Dr. David Jeremiah chronicles the tumultuous struggles of Christ's disciples following the Resurrection. From the brutal stoning of Stephen and Saul's radical conversion, through the unyielding persecution of Peter and the relentless wrath of Pilate, Jeremiah paints a magnificent portrait of the political and religious upheaval that led to the formation of the early Church. Complete with helpful background information about the characters, culture, and traditions included in the television series, A.D. The Bible Continues: The Revolution That Changed the World is not only a riveting, action-packed read, it is also an illuminating exploration of one of the most significant chapters in world history. Get ready to watch history unfold. The revolution that changed the world has begun! Written by prominent professor and skilled interpreter Charles Cousar, An Introduction to the New Testament provides a concise overview of the content and purpose of the books of the New Testament within the context of the church's early development. 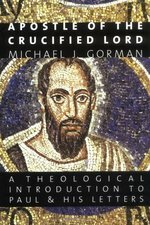 This cogent introduction gives serious attention to the history of earliest Christianity but always returns to the texts' theological meaning and significance, highlighting the relevance of these books for the church today. Unlike the many books that treat the apostle Paul merely as a historical figure and his letters as literary relics, this new study by Michael Gorman focuses on the theological message of Paul's writings, particularly what they have to say to the contemporary church. An innovative and comprehensive treatment of Paul, including commentary on all of the Pauline letters, Gorman's Apostle of the Crucified Lord unpacks the many dimensions of Paul's thought carefully and holistically. Six introductory chapters provide background discussion on Paul's world, his resume, his letters, his gospel, his spirituality, and his theology, while the main body of the book covers in turn and in full detail each of the Pauline epistles. Gorman gives the context of each letter, offers a careful reading of the text, and colors his words with insightful quotations from earlier interpreters of Paul. Enhancing the text itself are questions for reflection and discussion at the end of each chapter and numerous photos, maps, and tables throughout. All in all, Apostle of the Crucified Lord is the ideal book for students and any other readers interested in seriously engaging Paul's challenging letters. The Four Portraits, One Jesus E-Learning Bundle is only for students enrolled in a course at an institution that utilizes the Blackboard Learn(TM) platform. For anyone interested in knowing more about Jesus, study of the four biblical Gospels is essential. Four Portraits, One Jesus provides a thorough yet accessible introduction to these documents and their subject, the life and person of Jesus. 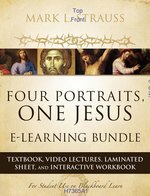 Now, with the Four Portraits, One Jesus E-Learning Bundle for use on the Blackboard Learn platform, the full suite of Four Portraits, One Jesus materials is available to online and distance-learning students. Like different artists rendering the same subject using different styles and points of view, the Gospels paint four highly distinctive portraits of the same remarkable Jesus. The Four Portraits, One Jesus E-Learning Bundle provides online and distance-learning students with everything necessary for a full introductory course on the Gospels.